The weather certainly has changed in the past weeks. Not a chance of those 20C or warmer days. Now we are walking to frost on the roof and windshields. This gets me thinking of a new scarf or a warm wrap. I have finished the first month of my "Temperature Scarves". I am using two rows of black to denote the end of each month. The reds and oranges are the warmer temperatures and the pale blue is the coolest so far ( -3 to 3Celsius). The one of the left features the temperatures reported for Waterloo, Ontario, the second scarf is for some other location in Canada. I am thinking of added scarves three and four, though loction three has a very naow range of temperatures for the year 15 -30 Celsius at most. Location four is a bit wider just above freezing to maybe 26C. Stay tuned for decisions on these. I posted an update of my Gretchen quilt when I updated my progress in the 350 Quilt block challenge. If you missed it, here's the link. For those who are interesting in Zentangles, be sure to check out my Tangled Thursday post, with links to this week's challenge. If you are thinking that you need to be artistic to draw Zentangles, then think again, all you need to be able to do is hold a maker and draw a line (it doesn't even have to be straight). I urge you to give it a try, it's so relaxing and as a bonus you'll probably come up with some lovely artwork. The big push is on this week to piece 40 4 1/2 inch blocks. The last class of my almost year long Saturday class is coming up and it's a show and tell. I want to be ready. This week to finish the blocks and next week to assemble the top. I am curious, do you find yourself changing your needlecraft activities as the season's change? This applies whether you are heading into winter as I am, or if you have warmer temperatures in your immediate future. Marie from Daisys Book Journal has started knitting a warm sweater. Over the Ros-the-Quilter, Roslyn is making steady progress on the Smith Morning Mountain quilt. 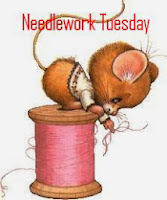 no I don't change out needle craft projects I am just a quilter - I know how to crochet/knit very simple scarves but really do not need them much here in the south and I have more of them then I really need. I do other crafting now and then but really not much and just stick with quilts. I must get this top done before Bonnie's next mystery begins Thanksgiving weekend. Good luck with your block piecing this week. I think I knit a little more in the winter. Although, I'm not sure it's because I have more time because there's a lot less yard work to do, or because the yarn is comforting and cozy when it's cold outside. Maybe a little of both.